Penn and Teller's live show has been a hit on Broadway and now has a permanent home in Las Vegas at the Rio Suite Hotel and Casino. Known for their outrageous blending of comedy and magic, which often stretches the boundaries of traditional magic, this iconoclastic pair's live show on any given night can involve knives, guns, a fire-eating showgirl and a duck. Known as the "Bad Boys of Magic," for supposedly revealing the secrets to their tricks, they may show you how it's done, but they still manage to leave you startled! Their weekly hit Showtime series, Penn and Teller: BS! as well as their Emmy-winning network specials and their legendary appearances on The Late Show with David Letterman and The Tonight Show with Jay Leno, had Entertainment Weekly name them two of the funniest comedians alive. 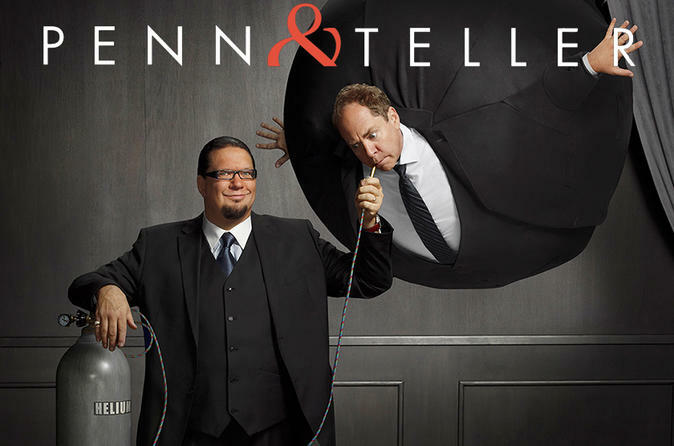 While Penn and Teller is a magic show, it does contain adult content and may not be suitable for children. Special Offer - Book with us and save 30% compared to the local operator's prices! - Book Now!